For the past couple years, Swim Across America has hosted two late summer swims on the same day- at opposite ends of the country! The Rhode Island and Seattle open water events are twin swims, and like any set, they’ve got a lot in common but also have distinct personalities. Since we’re not ones for sibling rivalry, we decided to spotlight both swims to connect our SAA family across the continent! Over on the Atlantic side, the smallest state in the union hosts one heck of a swim. Rhode Island’s SAA swim is marked by a mix of intense energy and intimacy, and is a blast to participate in. Not to be outdone by the youthful exuberance of the college kids, local Rhode Islanders have been incredibly dedicated to SAA. The family is small- watch for how many locals chat up RI-born-and-bred Olympian Clara Walker- and everyone knows someone who’s been treated at beneficiary Women and Infants, making this swim a very personal one. With both a half-mile and full mile distance, swimmers can choose their challenge at Roger Wheeler State Beach. Rhode Islanders commonly describe themselves as small but strong, but there’s nothing little about the life and heart emerging from the Narragansett waters as SAA swimmers run up on the beach! Out West, Seattle starts the summer sendoff in style with their swim off Mercer Island in Lake Washington. Always prepared to innovate, Seattle is one of the first cities in the SAA family to host a BREAKOWT clinic, which is run in conjunction with the Michael Phelps Swim School and preps swimmers for open water events. The Mercer Island swim has got something for everyone with a 50-meter kids’ splash, ½ mile and 2 mile swim. The entire family has almost no excuse to stay out of the water, and it seems that they won’t! SAA Seattle is hosting 37 (yes, 37!) tribute teams this year, so Lake Washington will be teeming with powerhouse teams! The most unique aspect of Seattle’s event is that it’s the only one in the nation that has a corporate matching system. Through the McAdams Wright Ragen Matching Program, a bonus will be donated in the name of the top ten teams if they raise a combined $120,000. It’s a generous and original program that proves that SAA Seattle leads the way in shaping unique events. Benefitting the Seattle Cancer Care Alliance, this West Coast swim’s goal is to raise three times as much as its twin swim, but that hardly takes away from the family-reunion feel of the event. Pancakes on the beach attract the likes of Olympians Ariana Kukors, Jeff Float, Dana Kirk, and Rick Colella, to name a few. That familial spirit hangs on the beach with the “why I swim” flags in Seattle, and considering the innovation that has come to define SAA Seattle, it makes for a vibrant event full of surprises and above all, life. Two oceans. Two events. One cause. 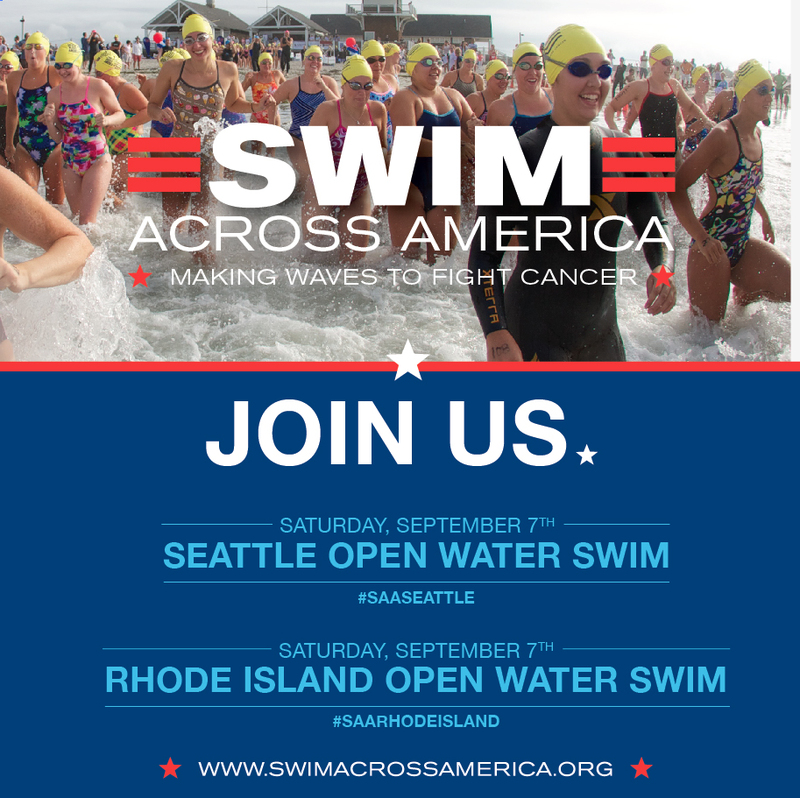 Like any set of twins, our swims in Seattle and Rhode Island are connected in spirit, and serve to connect all who’ve been touched by cancer. We’ll see you on the beach- you choose the coast!